Faith is about loving God… it is more than an acknowledgment of God’s existence or a statement of belief regarding God. It is the deep desire to know God, to be one with God, and to worship God. A variety of ways that we can develop our knowledge of and love of God includes: Prayer, Bible study, Worship, fasting, & conversations with other Christians. John Wesley, founder of the Methodist movement, called these practices means of grace. Means for developing our relationship with God and for experiencing God’s presence in our lives. Are you coming to the Carroll First United Methodist Church? We welcome you! We hope you find our worship experience meaningful and worthwhile. We would love to have you join our church. Below please read about the different ways to join us or to move your membership. If you need the help of our pastor or the office staff please contact the church office by calling 792-1122 or e-mail us at carrollumc@msn.com. If you a member of another United Methodist Church then your membership can be transferred to Carroll's church. With the information you provide, our church office will contact the previously attended church asking that the proper information be sent. This allows the previous church to adjust their rolls and allows our church to update our membership. *Include your full name (maiden if applicable), telephone & address, and the church name & address to transfer your membership from. Your form will then be submitted to the church office and you will receive an e-mail the next business day regarding your submission. Are you leaving Carroll First United Methodist Church? Perhaps you have moved? Or are attending a new place of worship? Perhaps we can help you renew your faith or assist you with transferring your membership to a church you are active with. *Include your full name (maiden if applicable), telephone & address, and the church name & address to transfer your membership to. Your form will then be submitted to the church office and you will receive an e-mail the next business day regarding your submission. If a member of another Christian faith background and beyond confirmation age, you can become a member of the United Methodist Church by Profession of Faith. This allows a baptized person to become a member by renewing the baptismal covenant in which we profess our faith in God and declare our desire to live our lives as disciples of Jesus Christ in the United Methodist faith. This is a time to verbally share with the church and yourself that you repent of your sins and believe in Jesus Christ as your Lord and Savior. You can be of a no-faith background or another Christian faith belief before entering into the membership of the United Methodist Church. Confirmation is a class for young people allowing them to explore their beliefs and faith in order to become a more mature Christian and become members in the United Methodist Church. Confirmation refers to the decision a person makes to respond to God's grace with intentional commitment and publicly reaffirming his or her baptismal vows before the congregation. Most confirmands are youth between the ages of eleven and fourteen (ours are 7th graders), who have been nurtured in the church since their baptism as an infant or young child or express interest in becoming a United Methodist. Confirmation is preparation aimed at leading youth and others to embrace their vocation-the calling of God to live and witness to the reign of God announced in Jesus Christ. Our confirmation youth go through a course with our Pastor and his wife to learn about the meaning of Christian faith; the history and teachings and The United Methodist Church; and an explanation of the baptismal (already taken or to be taken) and membership vows they will be professing. Confirmation Sunday is usually the first Sunday in May. Confirmand Requirements: Attend weekly worship to acolyte, take sermon notes, participate in Confirmation retreat, help with the Easter Sunrise service, and review lessons during weekly confirmation class. This ceremony marks the beginning of a journey in the nurturing fellowship of a caring, learning, worshiping, and serving congregation. The baptism of children and their inclusion in the church, is a vivid and compelling witness to prevenient grace, before they can respond with their own confirmation of faith . One can receive Christian baptism as an infant, youth or adult. Not yet baptized? Sacrament of Baptism can take place during time of Profession of Faith or on its own. Pastor will talk with those receiving baptism prior to the confirmed event. Please fill out the baptism form located below. We at the United Methodist Church practice an open communion. One need not be a member of this church or of any church in order to partake. Christ laid down his life for all who wish to take him into their hearts. 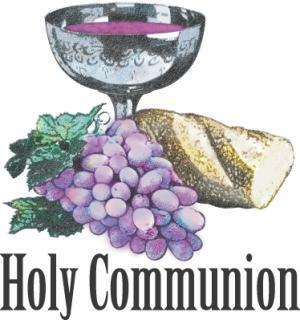 As Methodists we affirm the real presence of Christ in the bread and wine (grape juice) used in Communion. We eat the bread and drink the juice or dip the bread into the juice if served by intinction. Today's United Methodist Church is the descendent of several predecessors. These denominations are: Methodist Episcopal Church (1784-1939), Methodist Episcopal Church, South (1845-1939), Methodist Protestant Church (1828-1939), Methodist Church (1939-1968), United Brethren in Christ (1800-1946), Evangelical Association (1803-1922), United Evangelical Church (1894-1922), Evangelical Church (1922-1946), Evangelical United Brethren (1946-1968), United Methodist Church (1968- present).